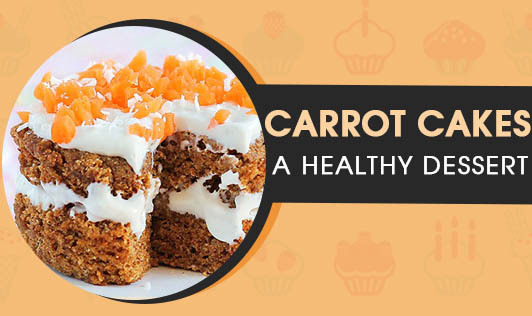 Carrot, the colorful vegetable is one of the most favourite picks for children. Kids love carrot in different forms - grated, cooked and raw. Here is a cake recipe for your child, a recipe that is healthy, attractive and perfect for your child to eat with gusto! • Sieve flour, baking powder, cinnamon powder and soda. Keep it aside. • Beat eggs and powdered sugar till frothy. Add oil gradually, beating them all the time. • Add grated carrots to the flour, Mix lightly, do not over do. • Add carrot flour to egg mixture and mix gently. • Pour it to a greased pan. • Microwave it for 4-5 minutes and check with tooth pick after 4th minute. • If the cake it sticking the tooth pick then keep it for another one minute more. • Let the cake cool for 10 minutes. You can add the icing if necessary. 1. Add only egg whites. 2. Substitute normal oil with olive oil. 3. Add brown sugar instead of white sugar. This can be served as an evening snack or a mid morning snack time meal. The recipe is simple, healthy and perfect to add variety to your kid's snack!